When we think of comorbid disorders to ADHD, we often envision disorders which can be diagnosed psychiatrically. Common examples such as depression, anxiety, Obsessive Compulsive Disorders (OCD), oppositional defiant disorders, and conduct disorders often come to mind. In addition, it is perhaps no surprise that learning disabilities are relatively common in children and adults with ADHD. If we do delve into physical comorbid disorders, things like Tourette's and tics may come to mind. For those skilled in the diagnosis and treatment of ADHD, even non-trivial comorbids such as bedwetting and sleep disorders may be apparent. However, there is another impairment that often goes along with the ADHD population, especially in children. Sensory processing disorders are often seen in the ADHD population, especially in children. This includes more "physical" dysfunctions including the ability of the child to maintain balance and equilibrium. To the frustrated parent of coach of an ADHD child, this may introduce another complication with regards to sports or other activities which involve coordination and balance, such as basketball, baseball, tennis, soccer, gymnastics, musical instruments, dance, etc. Shown above is a human brain. 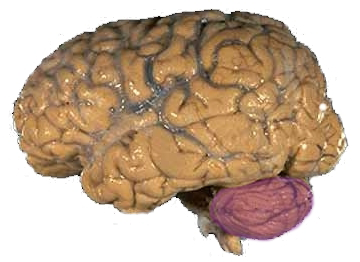 The Cerebellum region, which plays a major role in governing balancing functions and may be compromised in a significant subsection of ADHD children, is shown in purple in the top picture. The area highlighted in orange in the bottom drawing roughly corresponds to the prefrontal cortex region of the brain, which plays a major role in impulse control. Deficiencies in blood flow and overall activity of this prefrontal cortex region of the brain are often seen in children (and adults) with ADHD, and may be responsible for some of the difficulties in filtering out comments and actions for appropriateness. Many studies involving brain regions and ADHD often miss this connection. The relationship between these brain regions may go a long ways in explaining ADHD comorbid disorders as well, especially the more "physical" ones such as speech complications, developmental coordination disorders, etc. While perennial "hot spot" brain regions, such as the prefrontal cortex, are frequently mentioned in studies involving brain activity in ADHD, this particular brain region is actually intricately interconnected with the cerebellum (as well as another key brain region, the basal ganglia. The role of the basal ganglia in kids with ADHD has been discussed previously in other postings, but in general, the basal ganglia tell how fast a person "idles". 'Type A' personalities, such as workaholics, individuals with OCD and overly focused individuals typically have overactive basal ganglia, whereas many with ADHD often exhibit underactive basal ganglia.). We have already mentioned that the balance-governing regions of the brain (the cerebellum) is interconnected with a key impulse-control region of the brain (the prefrontal cortex or PFC). We also mentioned that impulsivity is a characteristic of the Hyperactive-impulsive and Combined ADHD subtypes (as opposed to the more inattentive forms of the disorder). Interestingly, the prevalence of balance dysfunction cases seems to predominate in the combined subtype of ADHD (main paper as reference source). This correlation lends further credence to the hypothesis that the balance-governing and impulse-governing regions of the brain may be "co-affected" in the case of the balance-deficient, hyper-impulsive ADHD child. ADHD is often associated with developmental delays. Indeed, studies highlighting a delay in cortical maturation in children with ADHD suggests that children and teens with the disorder may fall "behind the curve". By its own very nature, the vestibular system often does not fully develop until the age of 15, so immature development in this brain region may result in deficiencies in this system throughout almost the entire span of childhood in an individual with ADHD. Additionally, EEG and imaging studies have also demonstrated relative deficiencies in both size and activity (by measuring blood flow patterns) in various brain regions of ADHD children. These include the cerebellum and the caudate nucleus. Both are interconnected and associate with the "ADHD region" of the prefrontal cortex (PFC). This PFC region plays a major role in the impulse-control process and deficiencies in its function can result in a weak self-regulatory system of impulsive behaviors (which are hallmark characteristics of ADHD, especially in the hyperactive/impulsive and Combined subtypes). The cerebellum gathers input from visual, vestibular (inner ear), and somatosensory (mainly tactile senses, such as perceived through the skin and internal organs) systems. As we can imagine, a defect in one or more of these information-obtaining sensory systems, and the cerebellum (as well as the interconnected region of the PFC) may be compromised. Thus ADHD and sensory deficits may be intricately related. Taking this one step further, we may wish to explore the link between ADHD and sensory disorders, including processing disorders and sensory integration disorders. One thing is for sure, however: ADHD is not simply limited to deficits in the PFC! The vestibular system also plays a crucial role in what is known as "gaze stabilization" (i.e., stabilizing the focus on a particular fixed object when you yourself are moving). The very nature of "gazing" obviously has visual implications as well, so a deficiency in the vestibular component of gaze stabilization may also affect visual input success as well. Interestingly (an perhaps not surprisingly), visual input deficiencies are also seen at high rates in children with ADHD. This may actually serve as one of the key contributing factors as to why maintaining attention (to, say, a teacher), may be so difficult for ADHD kids, because they literally are having trouble focusing their visual attention (gaze) on their target of interest (i.e. a teacher standing up in class giving a lecture), especially if the child is already fidgeting around in their seat. In other words, there may be some inherent deficiency in this particular component of the attention span, and needs to be addressed further in the near future. A platform which can induce a feeling of motion on a child who stands upon it (this disrupts the somatosensory component of balance, forcing the child to use their visual or vestibular functions to compensate for the somatosensory impairment). Surrounding scenery which can visually give the illusion of motion. This forces the child to use their vestibular and somatosensory methods of equilibrium, as the visual sense is disrupted. Another variation of this is to have the child perform with their eyes closed. A combination of the two methods above will isolate the vestibular component of balance, as both the somatosensory and visual sources of balance are now both compromised. While balance-related issues can stem from visual discrepancies, somatosensory issues (i.e. the sensations of touch and pressure from the skin and even internal organs), and vestibular (inner ear) imbalances, it appears that ADHD children are most likely to suffer from visual imbalances. This is closely followed, however, by deficits in vestibular function. Somatosensory difficulties appear to occur in ADHD children as well, but the role of this system is likely to be much smaller than for the other 2. Possible academic implications of balance dysfunction and ADHD: Does the source of an ADHD child's balance deficiency affect his or her sensory learning style? The following points are simply the result of this blogger thinking out loud. Nevertheless, these might be some good topics of future study, as balance difficulties may be useful in evaluating academic strategies. These findings on balance may even extend to the classroom and affect the learning environment of an ADHD child. Given the above, abnormalities in these areas may even affect a child's mode of learning and learning style. While these assertions simply remain personal hypotheses of this blogger, a child with visual discrepancies leading to balancing difficulties may also be deficient in visual perception and therefore struggle in a visual-dominated learning environment. He or she may gravitate towards a more auditory or kinesthetic style of learning. Conversely, it is also possible that vestibular-regulated balance dysfunctions, which stem from the inner ear may actually extend to a child's auditory learning capabilities. Again, this remains a hypothesis, but given the fact that severe childhood ear infections can affect both balance and hearing (as well as ADHD symptoms, see previous post on childhood ear infections and ADHD), a child with vestibular-related balance deficiencies may also have more difficulty in a predominantly auditory-based learning environment. This may spell bad news if an ADHD child's teacher engages in more auditory discussions or as the child moves up to high school and college courses where an auditory lecture is the more common form of teaching and communication. A double-whammy? : Given the fact that children with ADHD may suffer from both vestibular and visual (and even somatosensory) information processing for balance, it leads us to wonder if the child may also have learning deficits in 2 of the 3 major forms of learning (visual, auditory or kinesthetic). If this is the case, trying to accommodate an ADHD child's education could be extremely difficult, if he or she must heavily rely on only one predominant mode of acquiring and processing information. For example, if a child were to undergo a study similar to the one listed above, and it turns out that he or she is weak in both the visual and vestibular forms of balance, and (this is a big "if" and is only hypothetical at the moment) the whole balance governing/learning style hypothesis holds true, he or she may have to rely on a predominantly kinesthetic form of learning. While this child may succeed in hands-on learning subjects (i.e. frog dissection or wood shop class), he or she may have an exceedingly difficult time in other subjects such as algebra or history where hands-on-learning opportunities are more difficult to implement. The role of balance and sensory stimulation may have even greater-reaching academic implications. Another study just came out recently investigating the role of posture stability (i.e. how well a person stabilizes their center of balance) on ADHD and dyslexia. The study found that comorbid ADHD symptoms greatly influenced the effects of posture stability in dyslexic individuals, which may even have implications to affecting the reading environment of the individuals with dyslexia. It's important to keep in mind that this study involved adults instead of children, but the fact that ADHD may play such an integrated role into sensory modulation of other disorders into adulthood may signify the deep level of inter-relationship between cognitive function and sensory motor stimulation. Vestibular Stimulation as an alternative form of ADHD Treatment? : As an interesting aside, there has been some pronounced effect on treating ADHD symptoms with a non-pharmaceutical alternative method called vestibular stimulation. We will be addressing the validity of these findings and their potential for practical usage in a later discussion. Does Blood Type Affect ADHD? Childhood Ear Infections and ADHD: Why the link? Can ADHD be Treated with Ginseng? ADHD and Handwriting: What's the Connection?